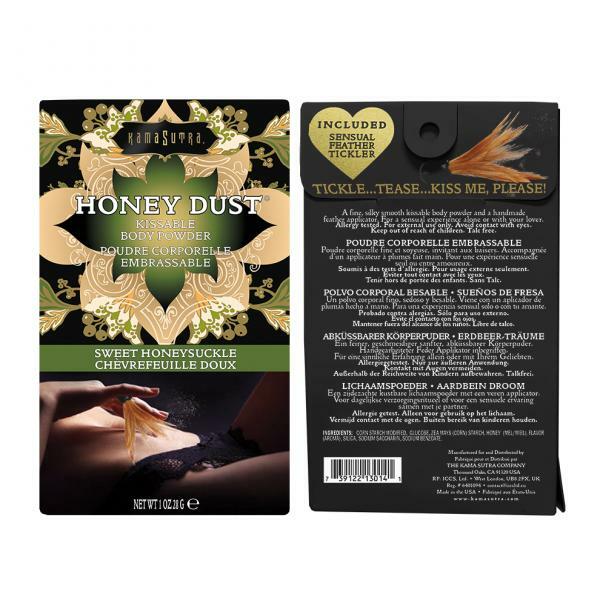 Kama Sutra Honey Dust Honeysuckle kissable, moisture wicking body powder that leaves skin silky soft and delicately scented. Talc free. Features: delicious, kissable body dust. Lightweight formula wicks away moisture, leaving skin soft and smooth. Six irresistible flavors, each imparts a delicate fragrance on the skin. Flavor: Honeysuckle. Delicately sweet honeysuckle nectar. Use anywhere on the body. 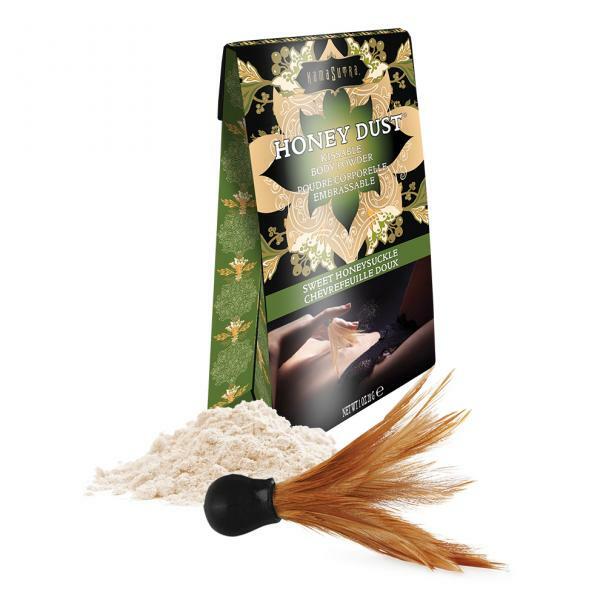 How to use: with your partner use the flirty feather applicator to dust Honey Dust onto the body and follow with kisses. As part of your daily regimen dust onto the body before dressing to stay cool and dry all day long. Be sure to remove any excess dust if wearing light colored clothing to avoid staining. For beautiful hair use as a dry shampoo by massaging a small amount into dry hair at the roots leaving it clean, with added volume and smelling amazing. 1 ounce travel size. Ingredients Honeysuckle: Corn Starch Modified, Glucose, Zea Mays Corn Starch, Honey, Silica, Flavor, Sodium Saccharin, Sodium Benzoate. Made in the USA.